Western Flower Thrips has several crop hosts including: peanuts, tomatoes, lettuce, celery, peppers, peas, onions, apples and grapes. Greenhouse host plants include: tomatoes, sweet pepper, cucumber, chrysanthemum, roses, impatiens, ivy geranium, petunia, gloxinia, orchids, dahlia, primula, gerbera, fuchsia, and African violet. Several common weeds also serve as potential hosts of topsoviruses. Some of the most important are Galinsoga sp. and chickweed (Stellaria media). 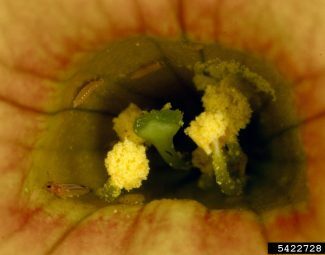 Primary economic damage is due to Western Flower Thrip’s (WFT) function as a vector for the topsoviruses tomato spotted wilt virus (TSWV) and impatiens necrotic wilt virus (INWV). Topsoviruses have over 600 plant species hosts. 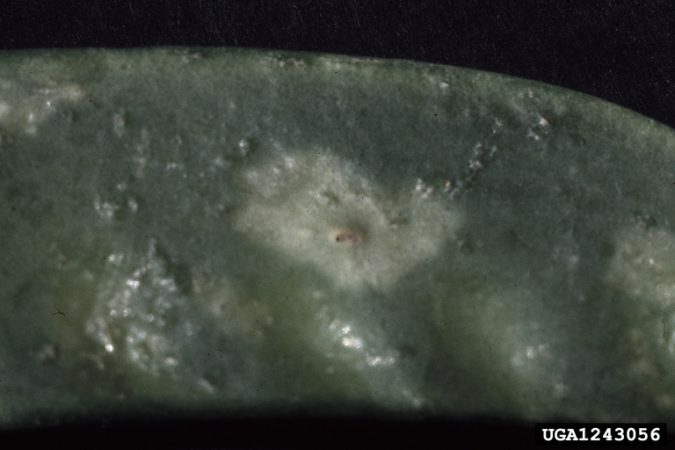 Symptoms vary widely among different host plants and include leaf spots, necrotic areas, mottling and ring spots. There is no known cure for infected plants. The only WFT stage of development vulnerable to being inoculated with topsoviruses is 1st larval stage. Inoculation is via feeding on infected host plants. 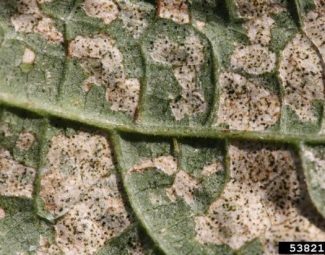 Topsoviruses develop inside infected thrips and are spread by adults as they feed on plant tissue. A minimum of 15-30 minutes of feeding is required to inoculate uninfected host plants. Males are much more efficient vectors than females. Damage leaf and vegetative structures by piercing with mouth and sucking host fluids. 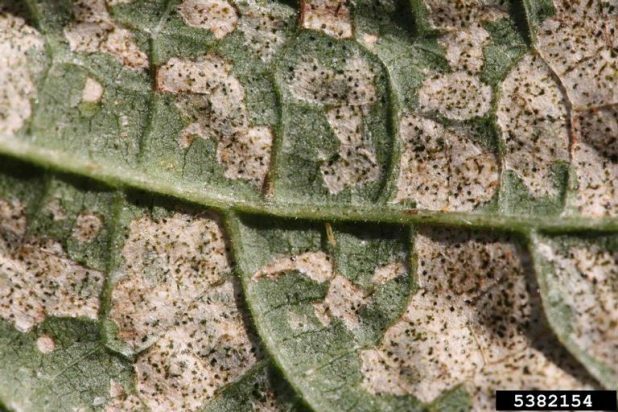 Feeding damage results in structural deformation, flecking and/or silver coloration of host plant. Vegetative feeding can lead to economic cosmetic damage. Feeding on flowering structures can lead to malformation of and/or cease development of flower. Egg lay in fruiting structures often creates a discolored halo effect around oviposition site. Discoloration is only cosmetic, but lowers marketability of fruit. Reside inside flowering structures and other protective areas that shield them from contact insecticides. Can develop in temperatures between 50-90 F.
Eggs… (2-4 Days) Can be inserted in various plant parts. Larva… (3-6 Days) 2 instars. 1/50 in. long. 1st instar 1-10 Days, 2nd instar 3-14 Days. Mobile, but generally stay within blooms unless pollen is depleted. 1st instar only stage capable of acquiring topsoviruses. Pre-Pupa and Pupa… (2-5 Days) Larvae drop to ground to pupate. Non-mobile. Adult… (30-35 Days) 1/25 in. Females range in color from yellow to black. Males are smaller than females and are consistently yellow. Feed on fruit, fruiting structures, leaves and other vegetative host parts. Females usually only mate once/3 weeks. Can lay > 100 eggs. 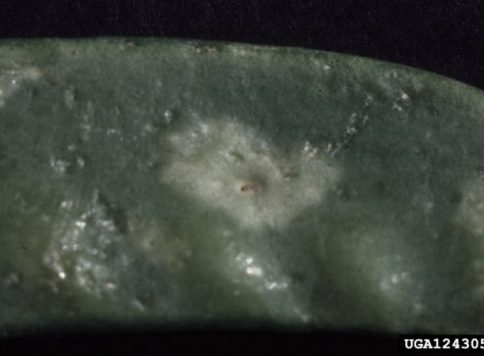 Eggs can be laid before mating (always result in male progeny) or after mating (resulting in mostly female progeny) and are deposited just under the dermis of leaves, buds and floral tissue. Weak fliers. Overwinter as adults. Overwinter in a wide variety of crops and weeds. Sticky cards and/or direct sampling of blooms by shaking into Styrofoam cup can be used to monitor population numbers. Blue sticky cards are more attractive to WFT than yellow, but are less attractive to whiteflies. In greenhouses, 1 card/200 sq. meters has been suggested. Treatment thresholds vary according to crop and plant stage. 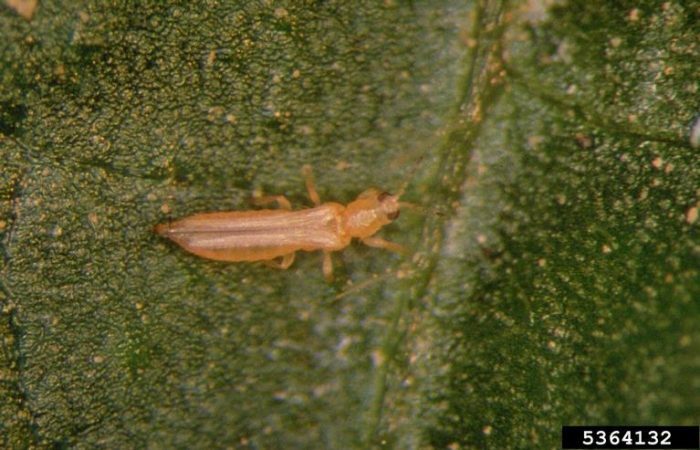 A threshold of 5-10 thrips/card/week is commonly used. Indicator plants that are highly attractive to thrips such as petunia or fava bean can be planted and monitored for symptoms and presence of topsoviruses symptoms (i.e. 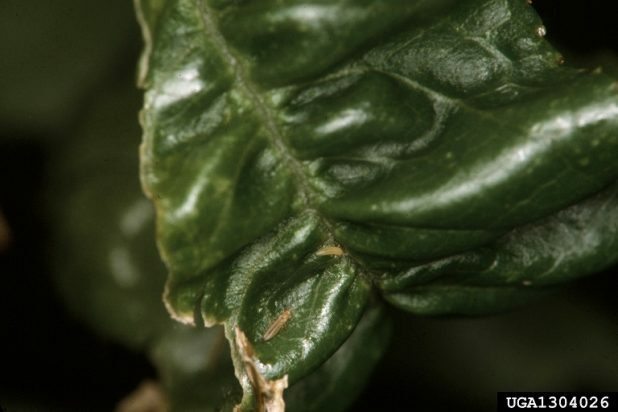 dark circles around areas of thrips feeding). Placing a non-sticky blue card above the indicator plants can enhance attractiveness. Topsoviruses do not become systemic in petunia cultivars such as “Summer Madness”, “Super Magic Coral”, or “Red Cloud”, so these will not serve as a source for further infection. 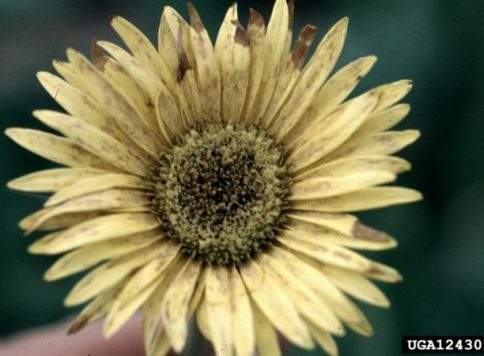 Remove flowers from indicator plants because they are preferred for feeding over the leaves and do not exhibit virus symptoms mentioned above. ELIZA and blot tests have been developed and are commercially available that allow growers to test individual thrips for the presence of topsoviruses. 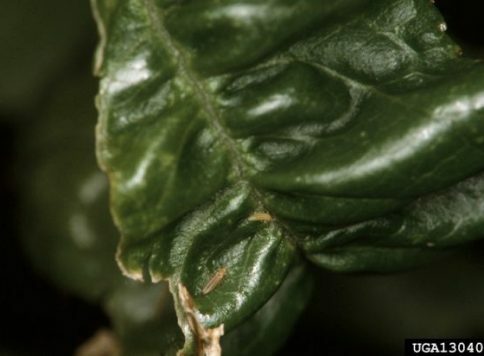 Overhead sprinklers can partially wash away thrips populations. Durations of 4 cm over 4 hours have reduced population by 50% in lettuce crops. 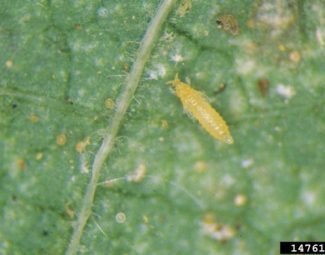 Predacious mites (only attack larval stages and perform better in crops with high pollen production). Be aware that most natural enemies will diapause during short day-lengths of < 11 hrs. unless artificial lighting is used to lengthen photoperiod. .
Small droplet size in spray applications will enhance penetration and coverage into small, protected spaces preferred by thrips. Mycotrol ESO – Adults are more vulnerable than larvae or pupae. Control weeds and grasses in fields and adjoining areas by mowing, discing, cultivation, etc. Do not mow, disc or dry down non-crop grasses and weeds during periods of flowering, fruiting or other susceptible periods of development to avoid flush of populations from weed hosts to market crops. Use of reflective UV mulches has been shown to reduce thrips populations. Use fine screens to exclude thrips from plants in greenhouses. Do not plant thrips susceptible crops behind winter wheat or rye because these crops provide excellent over-wintering habitat. Oats are a good alternative winter crop. Avoid over-fertilization. 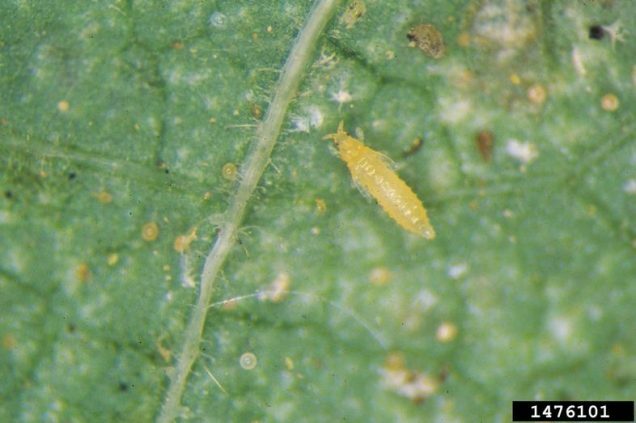 High nitrogen content in plants attracts thrips. Plant upwind of other more mature crops that may serve as sources for migrating populations. Make sure transplants are free of thrips infestation before planting. Destroy plant residue immediately following harvest. 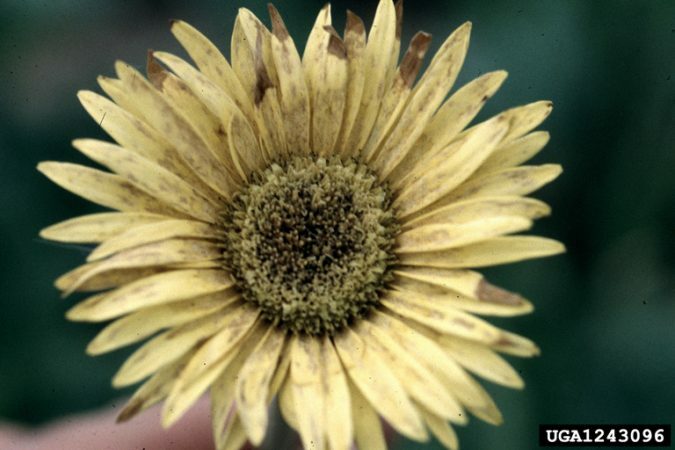 If/when possible, minimize or prevent flowering of crops or weed hosts. Fertilization via fresh and/or composted manure may provide some suppression of ground dwelling stages by promoting beneficial fungal habitat and control.